I was so bummed that it just did not stop raining from the second we left for NYC, right up until the second we came home. 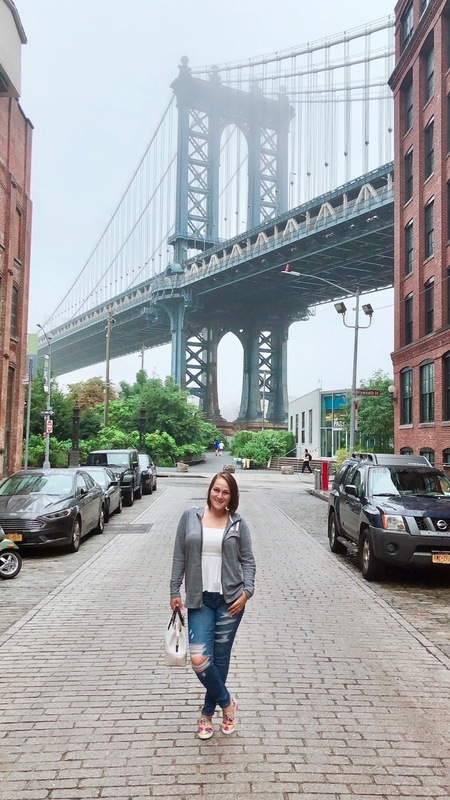 We did get a couple hours of dry weather on the last day, so we rushed to Dumbo Brooklyn to get some of the oh-so-iconic Dumbo Brooklyn Bridge shots. I can see why so many people flock there, it's an amazing view that makes the bridge seem so massive and beautiful. As you can see in the shots the tippy top is tucked up into the foggy rain clouds, and the sky was thick and gray. I definitely plan to return on a beautiful sunny day so the colors pop and the pictures are much more crisp and clear. Light is the one thing that can seriously make or break a shot, and in this case I had NONE...lol! I just had to share the below shot, I saw this on the corner just up the street from the bridge, I thought it went perfectly with my shoes. As most of you that follow me on Instagram know they're my absolute faves. We also stopped into a great little spot called Vida Verde where I met up with some friends Erin and Christina. Erin is the brunette and Christina is the blonde, we all sat down for some more than delish food, I had some sliders that were just out of this world. They were made up of ground brisket and short rib, omg they were so tasty. I can't believe I ate all three of them, yah know how you continue to eat it even after your full because it tastes so darn good. This was definitely one of those situations. They were so cute as was the restaurant, fun and colorful. You know I had to get in a photo op, and what better chance to show off my new Kate Spade bag and Gucci sunnies. All in all we didn't let the rain get us down, yes it made exploring the city a little more difficult but oh well wish happens. I did mange to find some more than amazing ice cream cone spots, keep an eye out for this week's Dessert Diva post on Instagram. For those of you that don't know, I post a delish sweet treat every Saturday. During the warmer months I do ice-cream cones, and boy did I find some great spots in NYC. There are so many cool places that I more than wish we had here in Baltimore or eve DC. Hello Luvs, I hope you all has a wonderful week! Either which way I have some amazing news for you guys, I recently got the opportunity to try out a product called Keranique. It's an amazing little system to help you achieve thicker, fuller, more lustrous hair. As most of you know I just turned 40 last year, and I have started noticing that my hair isn't as full and thick as it used to be, especially in the front area where my hairline is around my bangs. I also have very fine shafts, so my hair doesn't have a lot of body or natural fullness. 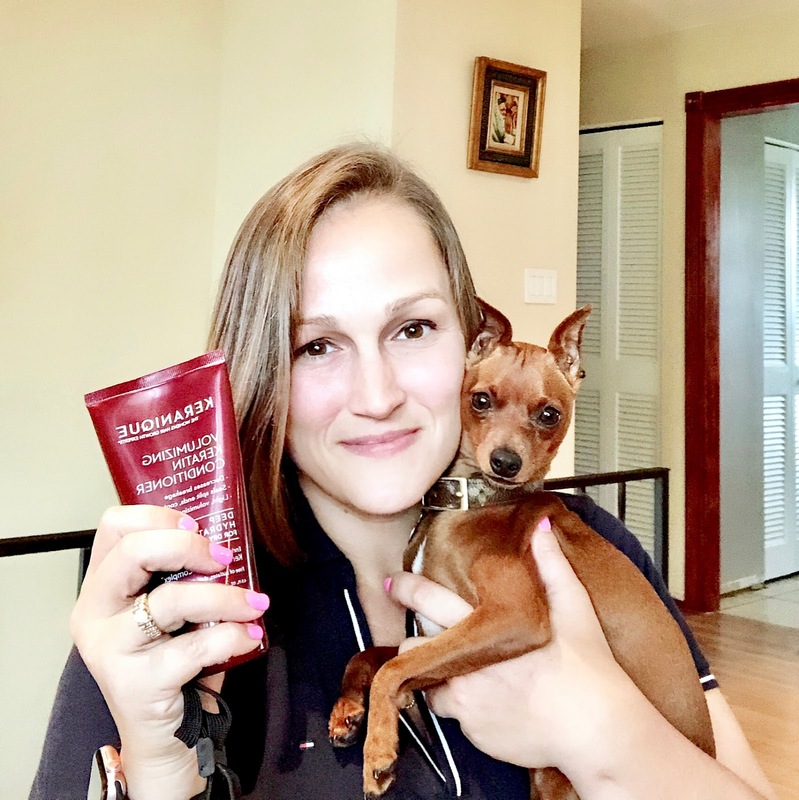 Let's just say I have had my eye on a product of this nature for the past year since I noticed the change, so I was very excited to get the chance to try it out. What Keranique does is help treat hair loss by pairing up a clinically proven hair regrowth system, with legit premium hair care for beautiful, thicker, fuller, and healthier-looking hair. There is the shampoo, conditioner, the lift and repair, and lastly the hair regrowth. I have been using them for just under a month and can see a very noticeable difference in my hair. It's for sure fuller and wow does it shine, I plan to continue using it and can't wait to post an update when I hit the 60 day mark. I'll give you a quick little breakdown of what each product does and how it works. We'll start off with the Scalp Stimulating Shampoo it's super easy to use, just apply it like your normal shampoo and let it sit for 1 to 2 mins before rinsing. It helps to remove build up, preparing your hair/scalp to receive the minoxidil and other treatments. Then there's the cream-based volumizing conditioner, it provides moisture without weighing your hair down. Then we have the key product in the system which is the Hair Regrowth Treatment with 2% monoxidil, an FDA approved ingredient that is clinically proven to help regrow hair in women. 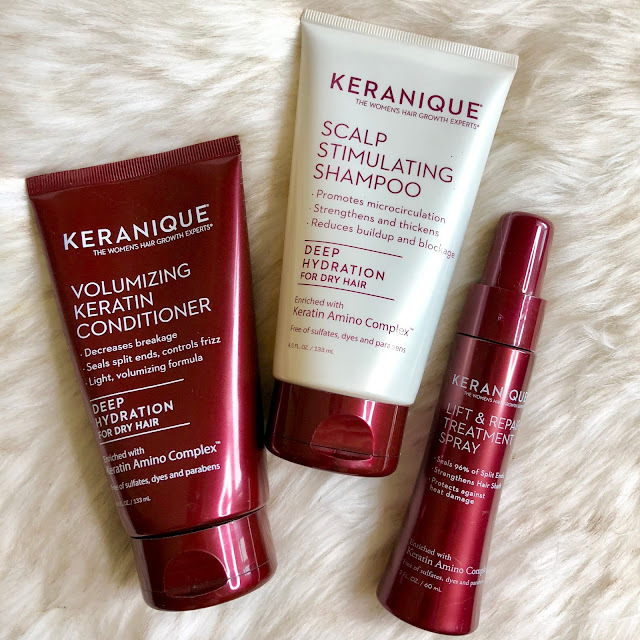 Immediately hair is left feeling softer and it looks voluminous due to Keranique's proprietary Keratin Amino Complex Infused shampoo and conditioner. Then lastly there is the Lift and Repair Treatment spray, it works just like a lift spray. It seals your split ends, strengthens your hair shafts and protects against heat damage. I love using it because it helps adds lift and volume, as well as protecting my hair during the blow drying process. All in all this system is amazing, my hair has never felt so healthy. For more info on the Keranique system go to their website: www.Keranique.com. PS...I will be going to Fashion Week in NYC on the 9th through the 11th, if there i somewhere you would love to see in the travel post let me know below. I just may go and include the details.